Brayan Martinez (203-F/C-91) put on an extraordinary performance in the last round for Panteras, receiving a Interperformances Player of the Week award for round 8. The player had a double-double of 13 points and 19 rebounds, while his team edged out Correcaminos (#2, 6-2) 80-77. The game was between two of the league's top four teams. Panteras is placed at 3rd position in Panamanian LPB. They would have been even better if they hadn't lost a few games earlier this season. Panteras will need more victories to improve their 5-3 record. has many years of experience at Panteras, through which he has constantly improved. has solid league stats. He is league's best scorer averaging so far 12.5ppg, leads league in rebounds with 13.2rpg and is league's best passer with 2.7apg is in league's top in and averages impressive 3.2bpg and 56.9% FGP. 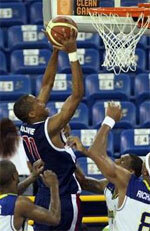 The second best player in last round's games was 32-year old Nigerian Ike Okoye (206-F/C-86) of Caballos. Okoye had a very good evening with a double-double of 22 points and 10 rebounds. Of course he led Caballos to another comfortable win outscoring slightly higher-ranked Atletico Nacional (#4, 4-4) 94-72. Caballos' 5th position in the standings has not changed. His team is not often considered as one of the league's best with a mere 3-5 record. Okoye is a newcomer at Caballos, but is already one of team's top players. He belongs to the best scorers in the league with 15.1ppg (#9). He also registered 10.5 boards per game. Third on the list of top players last round was American forward Anell Alexis (200-F-90) of league's top team Universitarios. Alexis showcased his all-around game by recording 15 points, eleven rebounds (!!!) and six assists in the last round. He was a key player of Universitarios, leading his team to a 94-63 easy win against Toros (#6, 0-8). Universitarios confirms their top position in the standings. Their record at this point is 6 victories and 2 lost games. Alexis has a great season in Panama. After only 8 games, he made it on the list of the league's leaders in assists with 4.8apg (6th best). 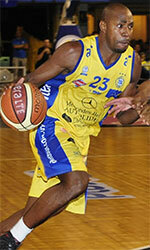 Anell Alexis has also Panamanian passport and can play in the league with a status of domestic player.